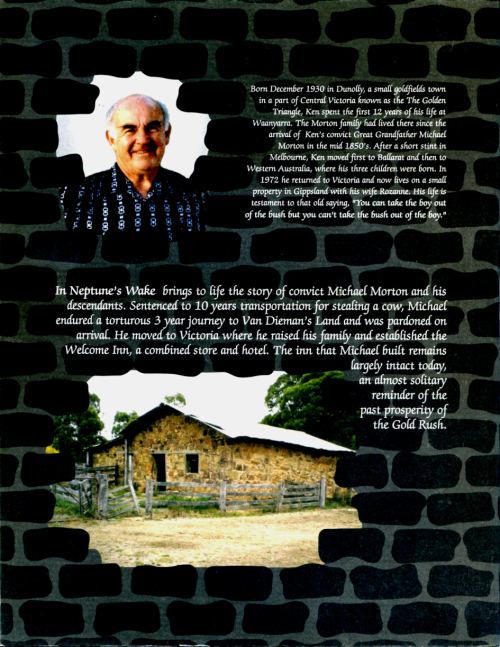 Whilst written primarily as a family history for his children, Ken Morton’s book “In Neptune’s Wake” records the story of one of Waanyarra’s pioneering families, the Mortons, and their associated families. The family, established by Irish convict Michael Morton in the early 1850’s lived at Waanyarra for almost 100 years—their original homestead “The Welcome Inn” still stands. The remaining chapters deal with the lives and activities of the people in the various branches of Ken’s family and not considered appropriate for inclusion on the site. Hard copies of the book are no longer available. Ken has updated the content progressively on CD since first publishing in 1993. Which Waanyarra family name are you a descendant of Robyn ? You may get some responses if people know this. Sir. I am researching an O’Brien family in North Tipperary. The Patrick Brien who was tried with John Morton & referred to in the Nenagh Guardian article on page 5 – have you any idea where he was from? He was transported on the Samuel Boddington ( gives in details ‘ tried with John Morton on board’ ). I see Gortaguna mentioned re the Morton family. Sadly, I don’t have any info regarding Patrick Brien but my best guess is that he was probably a local lad with the Mortons from around the Cullahill / Roscrae area. I am a decendent of Thomas Morton from Ampetheatre(I may have miss spelt this) a child of Michael Morton. I met you at one of the back to reunions and purchased one of your books. unfortunatley it was lost by a member of my family and was sad to read it is out of print as I would have liked to purchase another one. Will it be going back into print again? You are something of a blast from the past. 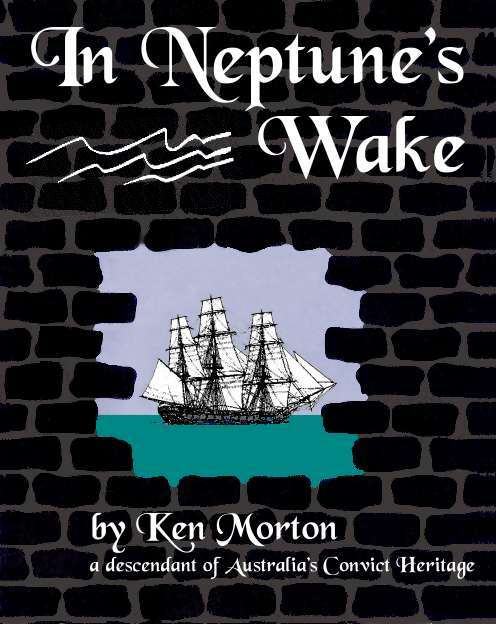 Ken I was saddened to see that you no longer have your book “In Neptune’s Wake” in print but noticed that you do have it on CD in PDF format. I would really like to buy one of these as Michael Morton is my great great grandfather on my mothers side Rita Harriet Ralston nee Morton. My grandfather Thomas Morton hales also from the golden triangle. Now that I am getting older and time is flying past, I would love to read everything about my family history and see the family tree, and as I did see my sisters copy of your book some years back and it had the tree in it. I spent a lot of time visiting with my Great Aunt Dolly Richards and her family up at Amphitheater when i was young. What great memories. Can you let me know if the CD is still available, the cost and postage.. thank you John. Apologies for the tardiness of this reply. The first three chapters of my book are available on the website. Follow the links from the “Books” category and you can download them as PDF files. These chapters are the only ones which deal with the history and genealogy of Michael Morton, his ancestry and descendants and would contain the information you are seeking I would imagine. The rest of the book is devoted to my family and would not be of general interest. If you are unable to access the files, send me your address and I will send them to you on a CD. Ken thank you for your great read. The only thing missing was the charts 7a and 7b the ones about John Charles (my grandfather Mortons brother)and Elizabeth Armstrong, chart 7a. I would also be grateful for my Great Aunt Dollys and Uncle Bills chart 7b as I spent a lot of time with them and my cousins at Ampi from mid 1950 till I last seen them about 1982. I left Victoria and now live in Queensland. Sadly I see that Great Aunty Molly (Alice May) and her husband Uncle Herbert who I never knew, I only knew Uncle Len his brother who remained with Aunty Molly until she died and then went back to England. If you have any information on them especially Aunty Molly I would be also in your debt. Thanks Ken and I am so glad that you where late,with your reply the charts were great and exactly what I needed. But most of all Kerry Morton’s email address is a great help. Putting a family history together is somewhat of a brain teaser and I must admit that I did stop before I went crazy. I actually had one relative dead and buried who was alive and kicking. Since emailing Kerry I have got the old bug back and those old memories keep flooding making me homesick for the wonderful times I lived with Aunty Dolly and Uncle Bill at Ampi and of course Nana and Grandpa at Golden Square. What a wonderful legacy this book is to your descendants, I became interested in it, after a search on Google that had convicts and Bermuda as the search criteria. My gr gr grandfather was sent to VDL via Bermuda and ended up in doing the slow long trip after being refused entry at the Cape. Once again thanks for a great read about your family history. Regards Wayne Hill from Wollongong. My second great grandmother is Maria Morton Born 1854 in Ireland came to Australia she married a man name James Freeman. But I’m having trouble finding her parents can you suggest best place to look.